Our Navy truly provides us with a great deal to be proud of! One way to demonstrate this pride is by displaying US Navy logo rugs. We offer an extremely wide selection of custom navy rugs, and also provide custom options to help meet your specific needs. The US Navy is the most powerful naval force in the world. The US Navy arsenal includes ships, submarines, aircraft, and many brave men and women who dedicate their lives to the service and defense of our country. US Navy logo rugs are very versatile and ideal for both indoor and outdoor use. There is no location in the United States that we cannot ship to, including all major naval bases. Our custom logo rugs are the most stylish way to show the world your patriotism. We take great pride in our products which are all hand crafted and designed with your particular size, style, and material in mind. The US Navy’s structure is as complex as you might imagine given their mission of defending our great nation through the sea. Most active duty and reserve naval personnel are in the Operating Forces and the Shore Establishment. The lowest ranking naval personnel are known as Seaman, Airmen, and Enginemen (E-1 to E-3). They can quickly advance to E-4, a Petty Officer, as they master certain technical skills. As you climb the ranks you can earn your way up to the level of O-10, which is a full Admiral. We can provide US Navy logo rugs that represent your current or former rank in the navy’s complex structure. Our current stock designs include Retired and Veteran Navy Rugs, Navy Seals, Standard Navy Logos, Fly Navy, Navy Chief Pride, and Naval Academy. As you can see we start with a well-rounded collection, and when you consider our customized opportunities, the options for US Navy logo rugs is truly limitless. We are happy to produce logo rugs which display your rank, ship, fleet, or any other US Navy designation you request. You might want to consider including interesting facts into the custom design of your rug. – All submariners are volunteers. While they do not let just anyone onto a submarine, those who are selected for the job have all volunteered for the positions. – The Navy SEAL Trident is often called the “Budweiser.” This is partly because the trident bares an undeniable resemblance to the Anheuser-Busch logo. The Basic Underwater Demolition/SEAL (BUD/S) course, is the intensively physical 25 week Special Warfare school attended by the prospective SEALs. – The US Navy does not have any walls or bathrooms. This is because the Navy historically is known for having its own lingo. A wall is actually a “bulkhead” and a bathroom is the “head”. The “rack” is where you sleep. – TOPGUN is real. The United States Navy Strike Fighter Tactics Instructor Program was founded during the Vietnam War. The program was a great success leading to improved kill-to-loss ratios of its combat aviation program. It also made for a great Tom Cruise movie. The US Navy’s power is unmatched by any other naval force in the world. However, the real power behind the Navy is the brave men and women who fill its ranks. From Petty Officers to Chief Warrant Officers, the Navy is an extremely talented fighting force who take great pride in defending our nation. 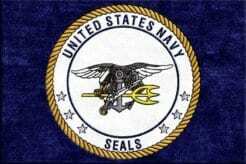 Show your support by purchasing US Navy logo rugs. You can demonstrate to the world that you truly believe in “Honor, Courage, Commitment,” with a custom designed rug. 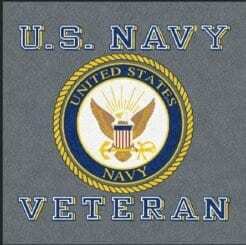 Former sailors can show how proud they are of their service with US Navy logo rugs. Our retired or veteran US Navy rugs are also an amazing gift for that special former sailor in your life. The US Navy is truly an elite fighting force. A US Navy rug is an exceptional way to honor this institution, and the men and women who defend our seas. Please contact us today and receive a quote for your custom Navy logo rug. Commander, Submarine Force, U.S. Pacific F.
Naval Submarine Base Kings Bay, Ga.
Free Personalized Logo Rug Pricing! Transform your Barracks, Training Quarters, Camp, Operating Base, Command Post, Battalion Center, Recruitment Facility or Military Office Environment with a personalized custom logo rug! Discounts on orders of 2 or more rugs of the same design. We work within your budget to help maximize an order!